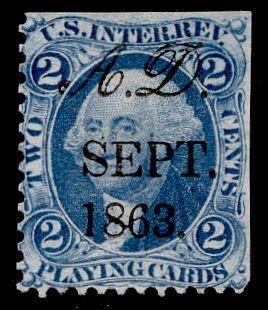 From August 1, 1864 to August 1, 1866 the tax on each pack of cards with retail price up to 18 cents was two cents. 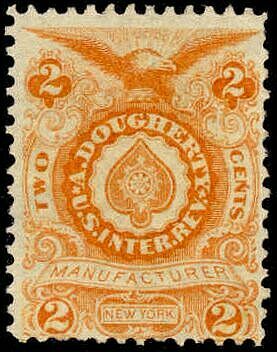 The two-cent Andrew Dougherty stamp was issued from May of 1865 to July of 1866. A total of 800,500 were issued, all on old paper. From August 1, 1864 to August 1, 1866 the tax on each pack of cards with retail price over 18 cents up to and including 25 cents was four cents. 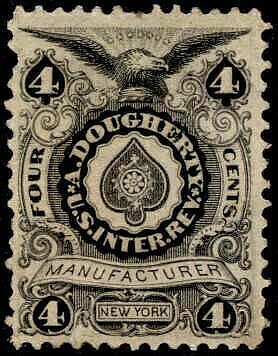 The four-cent Andrew Dougherty stamp was issued from December of 1864 to mid-September of 1866. A total of 515,250 were issued, on old paper. From August 1, 1864 to August 1, 1866 the tax on each pack with retail price over 25 cents up to and including fifty cents was ten cents. 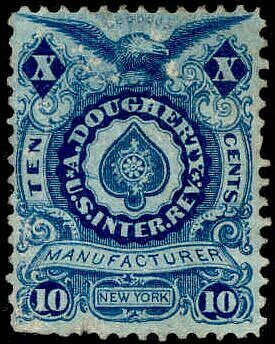 The ten-cent Andrew Dougherty stamp was issued from December of 1864 to May of 1866. A total of 442,700 were issued, all on old paper. From August 1, 1866 to July 1, 1883 the tax on each pack not exceeding 52 cards was five cents. 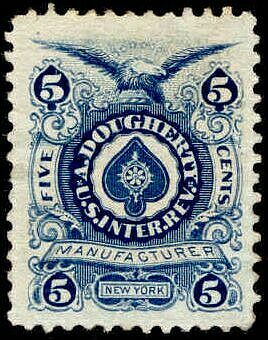 The large five-cent Andrew Dougherty stamp was issued from August of 1866 to sometime in 1867. A total of 4,631,985 were issued on old paper, 7,638,947 were issued on silk paper, and 179,496 on pink paper. The stamp above was printed on silk paper. 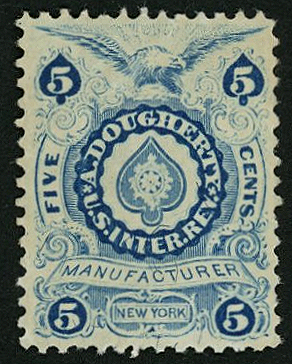 The small five-cent Andrew Dougherty stamp was issued from early 1878 to mid-February 1883. A total of 7,980,983 were issued on watermarked paper. 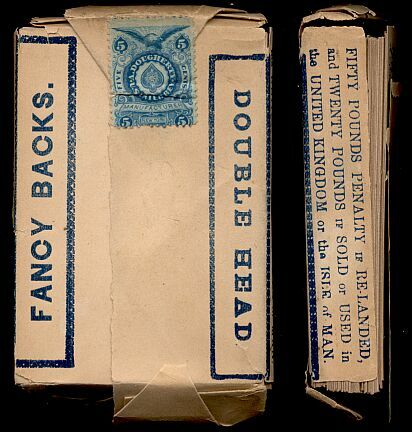 Use of the small Andrew Dougherty stamp on imported playing cards. 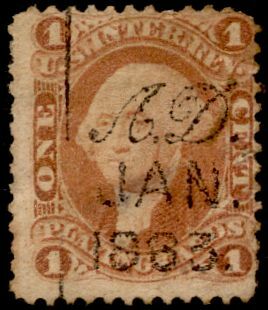 Two printed cancels of the Andrew Dougherty company on general issue revenue stamps. The second one is an experimental roller cancel.